Haven’t decided on a hotel yet? 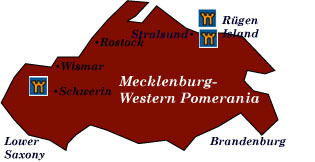 You can look at other available hotels in the Mecklenburg-Western Pomerania region with Booking.com. Quiet and unassuming, this region is marked by stretches of unspoiled coastline and Hanseatic towns lined with fine townhouses, cathedrals, and town halls. You’ll also find here some of Germany’s most beautiful Neo-Renaissance castles. Off the beaten path, with most of its visitors coming from the surrounding areas, Mecklenburg-Western Pomerania doesn’t attract the legions of foreign tourists as other parts of Germany, and this is part of the attraction. The experience here is genuine and unique. Wismar An original member of the Hanseatic League (Lübeck and Rostok the other two)—an alliance begun to combat pirates in the Baltic and which grew into a formidable trading bloc—today’s Wismar can boast the largest medieval town square (markt) in northern Germany. Gabled houses and great red-brick churches lend a pleasant atmosphere. Schwerin Since the 11th century, a fortified structure has stood on an island on the edge of Lake Schwerin. Schweriner Schloss was the 19th-century home of the Mecklenburg royal family, and in some respects, it resembles a Loire Valley château. A number of opulently furnished rooms may be visited and a small museum holds a huge collection of Meissen porcelain. The Staatliches Museum Gemäldegalerie, or State Portrait Gallery, hosts a fine collection of 16th- and 17th-century Dutch and Flemish paintings. Take a ride on a steam train that’s been running on a narrow-gauge track since 1886 to the fashionable 19th-century seaside resorts of Heiligendamm and Kühlungsborn. Stralsund A picturesque city center full of classic red-brick, Gothic gabled architecture, a fantastic Rathaus, and parts of an old 13th-century wall give plenty of historic atmosphere to this former Hanseatic League city. Rügen Island Since the 19th century, the famous and infamous have found inspiration on its hundreds of kilometers of sandy coastline, steep chalk cliffs, and oak and beech tree forests. Tucked into all this nature is a series of resorts and early 20th-century villas. Greifswald Suffering little damage from World War II, this university town attracts visitors for its medieval center. Usedom Island Emperor Wilhelm II used to summer on this island in the early 20th century. Most of the island remains a nature preserve where rare birds seek refuge. Usedom also has the distinction of being the sunniest place in Germany. Ludwiglust The jewel of this town is the schloss, the residence of the dukes of Mecklenburg-Schwerin. In the surrounding gardens, 24 cascading “waterfalls,” ruins, and a canal can fill an afternoon of wandering. Rostock Notable during the Middle Ages for its Hanseatic League status and the site of one of the first universities in the Baltic, Rostock’s attractions these days are its reconstructed town center of 13th- and 14th-century houses, museums, and churches, and its medieval walls. Neubrandenburg Come here to see the bizarre juxtaposition of bleak post-World War II concrete tower blocks surrounded by a largely intact 13th-century wall. Nationalpark Müritz Over a hundred lakes, streams, and rivers create a protected environment for a huge variety of water fowl. Many people come here to canoe and camp. In towns like Basedow, Neustrelitz, and Schlitz, fine palaces offer some good architectural sightseeing.